On June 10th, Alina Perde spoke at the Rise of the DevOps conference in Cluj-Napoca, Romania. Rise of the DevOps is a conference aimed at the growth of the DevOps community in Romania. It was hosted by 3Pillar Global at the Impact Hub, Cluj-Napoca on June 10th, 2017. In the presentation, titled “Infrastructure as Code,” Alina talks about what Infrastructure as Code is and what it does. She begins with a history of the DevOps movement and how we got to using code as infrastructure, before venturing into what Infrastructure as Code offers and why we need it. 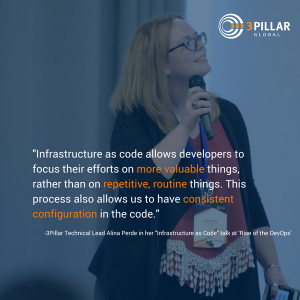 Alina follows this up with a use case presentation that lays down the real world context of using code as infrastructure and how she oversaw its implementation, challenges, and opportunities with her team. At the end of the presentation, a brief Q&A session was held.